You’ve decided to paint your bedroom walls blue; that is easy. Now to pick out your exact shade…and the truth is that there are a lot of different shades of blue. And each one, matched with varying hues and decor, evokes a different feeling than other shades. Overall, however, blue soothes as it transforms your bedroom into a spa-like retreat – a great choice for your bedroom. Most people shy away from dark colors, but contrary to popular belief, not everyone agrees that dark colors make the room smaller; some contend it makes the room larger, blending the edges of the walls, creating depth. 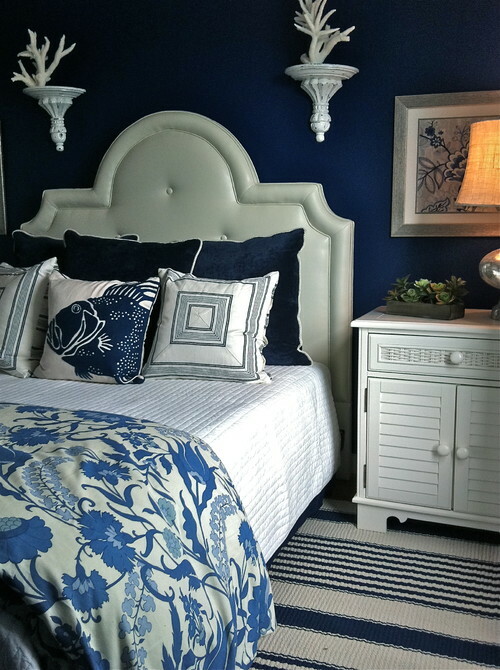 The dark navy on the walls of this nautical bedroom is calming. No doubt about it: no trouble falling asleep here. Creating a nautical theme? This deep navy blue matches Mystic Valley Trader’s Oceana Collection. The grey, cream and light grey-blue of this traditional bedroom creates gentle contrast, making it the perfect space to free your mind and de-stress after a long day. Alone, you might think this pastel blue is meant for the baby’s room, but with mix-matched furniture and subtly detailed pieces, this blue transforms a chic master bedroom to a whimsical mater retreat. This turquoise bedroom makes a bold statement with its color scheme. This designer tempered bold & playful with sophisticated neutral grey accents along with an elegant light fixture and rug. This shade of blue proves that blue isn’t simply one dimensional, as only a mere calming / relaxing color. It can brighten and energize your bedroom as well. They call it royal blue for a reason! This deep blue gives off an unmistakable aura of sophistication. Paired with cream and gold, these colors produce an arresting sharp contrast. This classically elegant master suite is a show-stopper. This regal blue would pair perfectly with Mystic Valley Traders’ Hulopoe Bay Collection. What is your favorite shade of blue? Let us know in the comments below. Play off the hues of a single color to calm your bedroom and relax the eyes – whether it’s shades of beige, grey, purple or blue. While viewing your bedroom, the eyes fluidly sweep over the soft contrasts. The key to a serene bedroom is dim lighting. Again, stay with the theme that nothing should be too harsh on the eyes. It is realistic, however, that on some occasions, you need full light, so leave yourself options. Invest in a light dimmer, candles, a nightstand lamp or any combination of these. Consider your window treatments. Do you want that calm, serene feeling to last you long into the morning? We recommend trying blackout drapes on your windows to control the bedroom lighting. Filling your exposed shelves with knickknacks and memorabilia is fun (and tempting), yet nothing ruins serenity like clutter. Design your storage pieces to those with doors. Tuck your TV behind the doors of an entertainment center; keep your books in the storage bench at the end of the bed; show as little clutter as possible. When it comes to luxury, a bigger bed is assuredly better. There’s a reason they are called “King” and “Queen”! Go ahead – spoil yourself. Blue has traditionally been liked and embraced color for centuries. And this summer, according to HGTV it is the color to include in your interior design. But did you know there are other benefits the stylistic to the color blue? Studies have shown that people, when looking at the color, feel calmer, more sedate, and more intuitive. And according to the Chakra color spectrum, blue increases speech, hearing, and even spiritual communication. What is it about this unique color that effects us like this? It could be due to us associating the color with calming things around us—take the sky or the ocean, for example. So, how do you add blue to your design without complete redo? The best place to start is the bed. The bedroom must be peaceful because it is a haven of sleep– hence scientists advice not to keep your work or computer there. If you want solid blues, the Profiles Silk Turquoise Collection provides a soft shade that functions into the colder months. For a modern, summer-weight blue try the Cottonwood or the Checkers Aqua ensembles to bring in blue with strong lines and very clean, geometric patterns. For flowing, bolder prints, the Damai and the Hulopoe Bay sets have darker shades that bridge multiple seasons with timeless and antique-inspired patterns. And finally, if you are looking to bedding that builds on a blue base, amplify the blue with another cool accent color as featured in the Oceana and the Namaste designs. All of these sets have a blue calmness yet invite your own interpretation. If you are more interested in just adding blue to your space, then adding it to a neutral color scheme is best. For example, pamper yourself with our 100% Egyptian Cotton sheets in 300-threadcount Navy or Sky or 650-threadcount Cyan or Sky and complementary pillows from the Santorini collection. Or enhance the Chakra energy with a small bowl of turquoise and aquamarine stones. Or even adding primarily blue artwork to the room to introduce that calming effect. So whether you are looking to add a little or a lot, blue is the color to incorporate into your summer style. With summer approaching, people are looking to freshen up their house’s look and style in a new and unique way. But have you ever considered using vintage and antique pieces to do that? There is nothing more modern about a space than having a balanced aesthetic between the current and old. So, how do you know what pieces work and what becomes too much? You don’t want your space to look like an antique shop nor out of style, so you want to have the furniture and accessories by three-fourths modern and one-fourth vintage. The best way to do that is have a majority of the heavy furniture and the bedding be modern and have vintage accessories. The Fulham Road, The Damai, The Chantilly and The Santorini all have the modernly traditional aesthetic that achieves that desired style. The Fulham Road and The Santorini have a more masculine aesthetic to them and this can be further enhanced with vintage pieces like a typewriter, cigar boxes, or military memorabilia. If you would rather soften the masculine style, include in the space a vintage chandelier, mother-of-pearl mirrors, or fashion sketches to frame on the walls. For a more overall feminine style, The Damai and The Chantilly follow that aesthetic. To enhance that style, add porcelain pieces, vintage fans, or a birdcage. However, if you want to add a masculine edge to these duvet covers, add accessories like an art-deco lamp, a record player (with plenty of vinyl records, of course), or a vintage globe. The important part to vintage-modern style is balancing all the aspects of it—that includes the balancing of old and new as well as the gender-associated styles in the room. You don’t want too much of one or the other because it will diminish the affect of the overall style. So after picking the perfect duvet cover to start, go to your local markets, antique stores, and eBay to find those complimentary pieces for a unique space. retirement planning on Throwback Thursday!